Proster HDMI Audio Extractor Provides 18 Months Warranty. 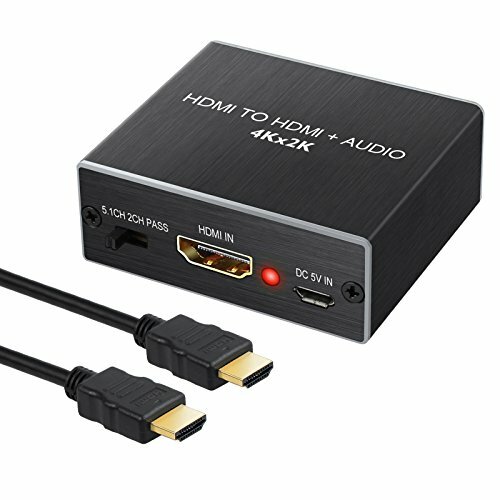 This 4K x 2K HDMI audio extractor not only to meet the ideal image of the HDTV but also to meet the need for an extract audio from HDMI source. It can extract the digital audio signal embedded in HDMI source and convert it through 3.5mm analog audio output and SPDIF output at the same time. The SPDIF output both can support 2CH audio or 5.1CH audio including Dolby Digitla 5.1CH and DTS 5.1CH. Pass: HDMI pass mode. The audio and video can be convertered from the HDMI output. SPDIF output audio both 5.1ch and 2.0ch (it depends on the audio source channel) and L/R will output audio with 2.0ch. 2CH Mode: Extract the digital 2CH PCM stereo audio signal from the HDMI input and the HDMI/ SPDIF and L/R output stereo audio. 5.1CH Mode: Extract 5.1 Dolby Digital / DTS and output via HDMI/ SPDIF/Analog. If you have any questions about this product by Proster, contact us by completing and submitting the form below. If you are looking for a specif part number, please include it with your message.